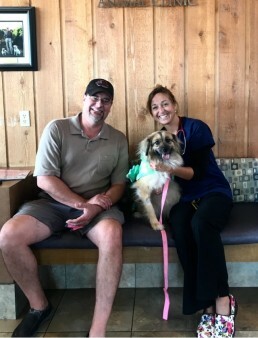 James G. and his dog Padme moved to Houston in August 2018. They were still getting settled into their neighborhood when, one night in September, James took Padme for an evening walk. During their walk, Padme was attacked by a neighbor’s dog, which latched onto Padme’s front leg. The force of the bite was so great that Padme’s leg was broken. James jumped on the attacking dog and wrestled it away from Padme. He was able to contain the dog and keep it from further injuring Padme, but in the struggle, his hand was broken. When James took Padme to see Dr. King at Lakeside Animal Clinic, he didn’t know what to do. Overwhelmed with his own medical bills to repair his hand, he wasn’t sure he would be able to afford to treat Padme’s leg, which was broken so badly that it needed to be removed. Dr. King helped James apply for a Rusk Veterinary Assistance Grant for Padme. Rusk Veterinary Assistance Grants are one-time grants offered by the Texas Veterinary Medical Foundation (TVMF) to provide lifesaving or life-altering treatment for an animal that is at risk of euthanasia, surrender or prolonged suffering. Since the attack in September, Padme and I have grown to know the care and love of our neighbors. We weren’t ready for the change, especially since we just moved here from SC, but I know that God never leaves us or forsakes us, and I have seen His love through people like you [TVMF,] Dr. King and her associates. Padme today is well on her way to total healing…minus the leg, and I just started PT for my hand. I remember seeing Padme give up when the dog ripped through her leg, I had no choice but to jump on the attacking dog to rescue Padme. Since the attack and surgery, Padme is having to learn to trust other dogs again. I have made it my goal to help her rehabilitate. It is a long road but will be rewarding. The great people at Lakeside and especially Dr. King were from the first day I brought Padme to them not only compassionate but super knowledgeable in helping Padme, and bringing me comfort. We have been taking walks again, albeit it’s difficult to work through the phobia of possibly getting attacked again. All my neighborhood is super supportive, and we have met new friends because of her attack. Since the attack and surgery, Padme has been super sweet. Her continued healing and progress can only be because people like you have helped us get through this tough time. My youngest daughter sent her a Halloween costume, and we had the opportunity to walk through our neighborhood showing off.